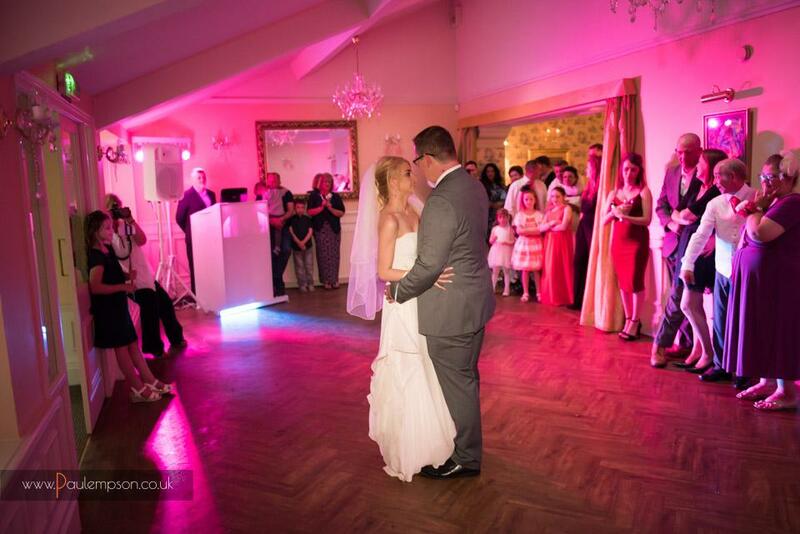 Lartington Hall is a gorgeous setting for weddings. It has a multitude of stylish, glamorous, welcoming, rooms –from the snooker room to the chapel- which give a grand but authentic feel. And the ballroom has to be the jewel in the crown with it’s enticing prosecco bar. 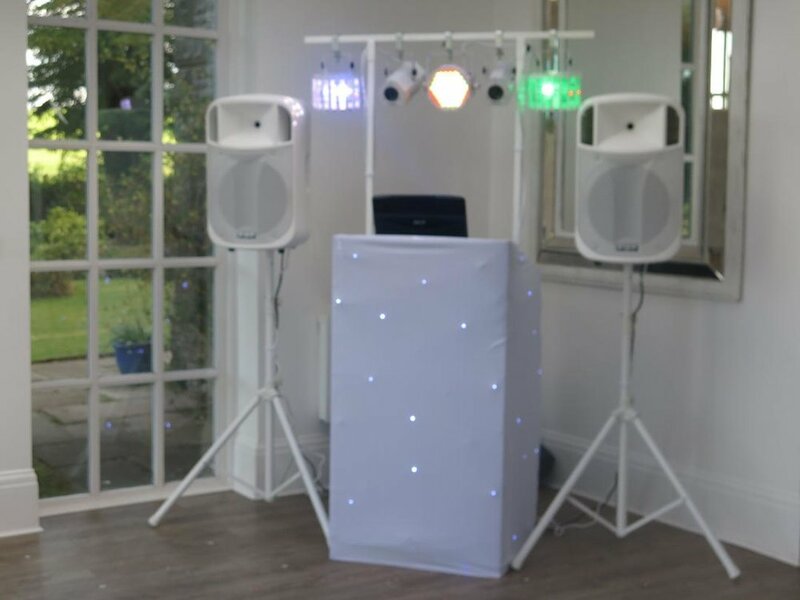 The all white dj set up looks sensational at Lartington Hall and often I am asked to provide mood lighting in the ballroom. The lights are placed discreetly around the walls of the function room highlighting parts of the architecture. Newton Hall describes itself as “bold, romantic and fantastical” wedding venue and it certainly is a venue that is cool and quirky.It has endless possibilities with outdoor weddings and beach weddings all available at this venue. It does have the wow factor and my dj set up compliments this look and helps bring the party to life. Slaley Hall is this magnificent, elegant Edwardian mansion- and it also the place where I got married. It has a modern twist on the inside with the brilliant chandeliers in the Kielder suite and outside it has a quirky Japanese Garden and Bogota (for all those photographs). 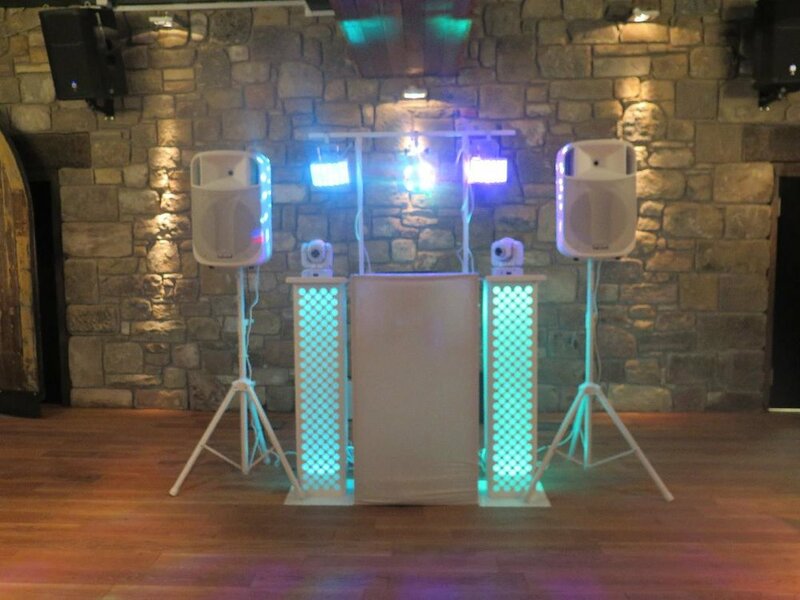 My all white wedding dj set up has been requested a number of times in the Kielder suite and I have added in mood lighting to enhance this experience. Whitworth Hall Hotel is a privately owned lovely old manor house set in its own grounds with the deer park as an amazing backdrop. Whitworth Hall is a great place to host that wedding celebration with a choice of 2 function rooms. I have dj weddings in both and love the atmosphere that this venue can create. Based in Otterburn Northumberland this experience begins you proceed up the impressive tree-lined entrance and the view the grandeur of Woodhill Hall. I’m always amazed at Woodhill Hall which has many unique extras- from the grand tipi and orangery to the new fantastic secret gin bar. The all white wedding dj set up matches and compliments either in the tipi or the orangery and helps enhance your day. Eshott Hall is one of Northumberland’s most beautiful 17th century country houses, set just off the A1 in idyllic surroundings. Eshott Hall has an elegant style designed to give the guests a taste of country house living. My all white wedding dj set up has been requested a number of times for Eshott and I have added in mood lighting to enhance this experience. The wedding ceremonies and receptions are held in either The Pavilion or The Treehouse. The Pavilion can accommodate large, lavish occasions as well as smaller, intimate celebrations. The Treehouse can host weddings outdoors beneath the woodland canopy, or smaller events inside the restaurant. I have been requested to be the wedding dj in both the pavilion and the treehouse and had great nights in both unique venues. Doxford Hall Hotel and Spa is a magnificent place to hold your wedding celebration. The room used for weddings provides a lovely exclusive area of the hotel so you can enjoy your day in privacy from other guests. I’m often booked as the wedding dj here with my all white set up and also often have my mood uplighting added into the book to set up a stunning looking room. Horton Grange is a magnificent intimate Country House Hotel situated just outside Seaton Burn and Ponteland in Northumberland. The conservatory restaurant looks absolutely magnificent and is enhanced with mu all white wedding dj set up and this has been requested on a number of occasions as well as my mooduplighting service. On occasions I have also been the wedding dj with my white set up in a marquee which is set up at the site of the house/gardens.